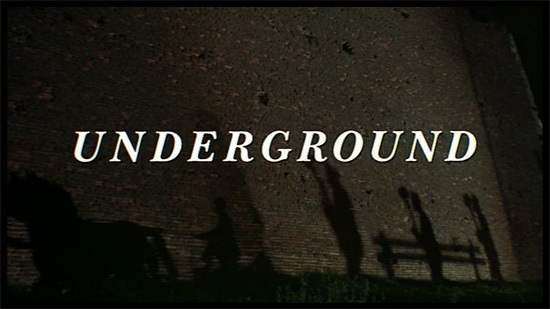 Underground(1995), directed by Emir Kusturica, tells the tale of the once great nation of Yugoslavia through the fictionalized relationship of a group of friends. Kusturica uses overblown acting, music, and circumstances to give a glimpse of the past and to evoke societal breakdown. The director creates a fairy tale or conversely, a eulogy for a country that collapsed due the misguided ambition of its people. This film starts just before the Nazis bomb Belgrade. This action illustrates the initial cause of the nation weakening. Blacky had just became a member of the Communist Party, due to his friend Marko, and this ultimately serves to be his undoing. Communism was supposed to give the Yugoslavians a strong cause to stand behind and its leader was Josip Broz Tito. Tito bolstered the populous to crush the fascist invasion and to ultimately live in communist splendor (Udovicki, 64). The direction that Underground takes in placing Blacky and his family in the basement for twenty years is used as an allegory of how Tito insulated his people from the outside world. The following are just a few of the policies that Tito enacted during his regime: a constitution and laws that supported only a one-party system, private businesses and property became rare, civil rights were minimized and the media became entirely state controlled (Udovicki, 67). In essence, Marko becomes the symbol of the Tito era by keeping his friends in captivity, just as Tito kept the Yugoslavian peoples’ will in captivity. The continued adulation of Blacky and his fellow “resistance fighters” to Tito was actually not false. Tito was, in fact, hailed as a hero because he did not enforce strict Stalinist Communism on the Yugoslavians (Udovicki, 65). The policies were strict but not to the frightening extent that they were in Russia. Many visitors to Yugoslavia during communism viewed the country to be the most open of all the communist states, because people were allowed to speak freely (to an extent) and to keep remnants of their culture (Lampe, 265). The culture that was most represented during the communist years was Serbian. The Serbian culture was embraced by more than one-third of the population and was not eradicated by the government (Udovicki, 65). Serbian cultural elements pervade the entire film. The riotous brass band that follows much of the action fills the film with Serbian flavor. The robust drinking and dancing that the people enjoy is also indicative of traditional Serbian culture. Some may even view the use of Serbian culture the film as an example of “Yugonostalgia”, which is a wistful look back at traditional Yugoslavian cultures (Lampe, 342). The use of slapstick that infects much of the film is a reflection of Serbian culture and serves to ease the memory of the sadness of the past. Marko repeatedly breaks bottles over his head to prevent Natalija from drinking and this, though overtly “Three Stooges”, is also a reflection of the culture. Traditional Serbian culture tend to enjoy strong emotional displays and frankness in actions (Bougarel, 163). The use of such wild mannerisms and mise-en-scene project an almost happy idea of the culture and not of how it finally disintegrated into civil war. The aftermath of Blacky and the others leaving the cellar reflects the disintegration of the nation. When Ivan searches frantically for his beloved monkey Sonny, it is symbolic of the Yugoslavian people searching for their lost identity. The disintegration of Yugoslavia began with Tito’s death in 1980, which caused a power vacuum to come into existence (Lampe, 332). The communists had a difficult time retaining power and this allowed such hideous people, like Slobodan Milosevic, to be able to gain power. The reign of Milosevic brought with it fervent Serbian nationalism, at the expense of other ethnicities. Marko’s demise comes at the hands of Blacky, which is quite overt in its symbolism of the civil war. As the film states, war is when a brother kills another brother. Though Marko and Blacky were not technically brothers, their rivalry got the best of them and served to destroy their lives. This is the same as the war itself, in which various ethnic groups battled, even though they had lived together somewhat peacefully for years (Lampe, 338). This section of the film is also telling, from a cultural standpoint, because the mise-en-scene is literal. We find Blacky leading a mercenary army that does notreally have a “side”. Blacky is representative of the idea that the civil war was a “war of everyone against everyone”(Bougarel, 157). The reality of this section is diametrically opposed to the lush composition of the rest of the film. The full horror of the war is felt, in this passage, when Marko and Natalija are immolated, Ivan hangs himself, and Blacky disappears into the well. The corruption, vengeance, and loss of self that accompanied the civil war are well addressed by this frightful end. The finale of the film can be interpreted as the dream of Yugoslavia that many of the nation’s people still yearn for. The rapture and community that is witnessed in this scene is fairly maudlin. Though we may be happy that everyone is friends again and can continue their lives in what is possibly heaven, it is still a reminder that this will never happen. Underground stands as a love letter to the unattainable past of Yugoslavia and the vitality of a fractured culture. Bourgarel, Xavier. Yugoslav Wars: The “Revenge of the Countryside” Between Sociological Reality and Nationalist Myth. East European Quarterly. V. 33. no. 2. Pgs. 157-175. June 1999. Lampe, John R. (2000) Yugoslavia as History: Twice There was a Country. Cambridge University Press: Cambridge. Udovicki, Jasminka & Ridgeway, James, eds. (1999) Burn This House: The Making and Unmaking of Yugoslavia. Duke University Press: London.